Climate change demands that we ask what kind of world we want to live in, and is as much a social issue as an environmental one. Everywhere in the world low-income, politically marginalized communities –historically the least responsible for CO2 emissions– are also those hardest hit by climate change and every aspect of the energy industry from toxic pollution to resource wars. We aim to support communities in making a “just transition,” in which social and ecological needs are prioritized in the shift to a low-carbon society. This means opposing policies that cause collateral damage to communities and strengthen existing inequalities. Real solutions to climate chaos will come from people and communities themselves, not from the entrenched powerful institutions that have gotten us into this mess. 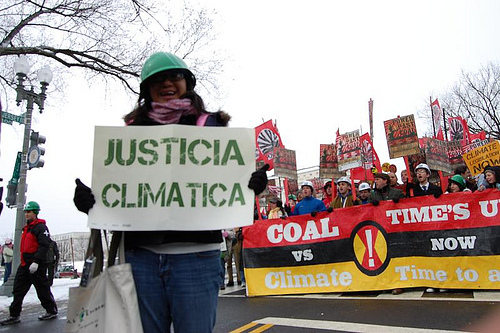 Climate justice is more than a goal; it’s a practice in the movement against climate chaos. No effort to create a livable climate future will succeed without the empowerment of marginalized communities.